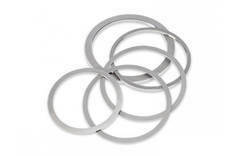 Maxwell manufactures steel stripper rings from bearing grade tool steel and these are available in thickness tolerances of +0/-0.0002 and with polished ODs. All rings are clearly laser etched for easy identification. We are putting forth an extensive variety of BUNA-N Stripper Rings according to necessity & drawings of customers. We utilized predominant evaluation elastic for assembling this space in order to guarantee its ideal execution and more administration life. This item is accessible in different determinations according to the necessities of customers. We are engaged in providing superior quality Stripper Ring to our most reliable clients. These Stripper Ring are appreciated by large number of clients due to high quality and durability. These products are available in market at most competitive rates. Stripper rings are a critical component in the slitting process. We offer all types of Metal to rubber Stripper Rings For Iron & Steel Industry and customized clad rings for ultra–sensitive surfaces. Thickness : 1 mm and above. SLITTER SPACES OR STRIPPER RINGS are available in variety of sizes on I.D. and O.D. 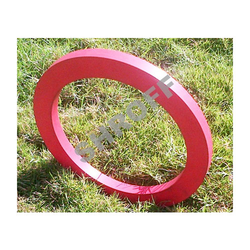 They can be supplied as rings to fit over steel rings or they can be molded and bonded onto steel rings. In either type they outlast rubber strippers by a margin of 6 to 8 times.